Another week another Gundam: Iron-Blooded Orphans and I’m kinda glad I didn’t miss this one. Considering that amazing last three minutes or so. I mean wow, that changes things a whole lot doesn’t it? Is this the spark for a greater conflict a second Calamity War as it were? Who knows, however that’s why we’re all here to talk about it. Before we can get to that though we need through a little bit of back story. The episodes opens with opposing factions within the Teiwaz family plotting against our heroes. Considering their leaders opposition to Naze and Tekkadan last episode the fact they’re still a little angry is not a huge surprise. However at the moment they’re hands are tied considering the substantial power and influence Tekkadan has amassed. An issue that will be resolved rather shortly. In orbit around Mars Teiwaz’s mechanical division is continuing to improve upon the Gundam Flauro’s, now painted Red. Shino’s colours. The Ryusei-Gundam is almost a go! However they have a mystery on their hands, the strange Mobile Worker like device, that seems to have no way to pilot. At the time I assumed it would worked potentially as an extension of the ship. As Eugine has shown an ability through his Alaya-Vijnana System to be able to effectively tether ships together. However as we’ll soon learn the reality is far far worse. Deciding to ask their new Gjallahorn allies for help Tekkadan transfers the information to McGillis and luckily so. 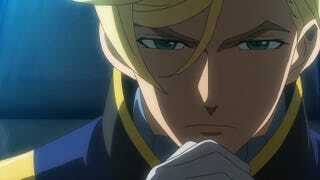 McGillis promptly contacts Orga and requests a personal meeting between the two heads. There he explains the reality of the situation to Orga, how what Orga has is no Mobile Worker but a weapon of a Mobile Armor a terrible weapon of the Calamity War. Deciding to head to Mars personally to inspect the main Armor McGillis and Orga head to Mars together. Where McGillis explains the terrible truth of the machines. The origins of the Calamity War the Mobile Armors are AI Killing Machines, designed to destroy and slaughter humans. It was because of them that the Gundam Frames and all Mobile Suits were first made to hunt and destroy these demon machines. Yes Iron-Blooded Orphans just pulled a Terminator. This guy for one loves it. It’s such an insane twist and one that’s never really been seen in a Gundam before (help me out we’ve had Remote Control Suits and Mentally controlled suits, however have we ever had Pure AI?) really setting IBO apart from its predecessors. This information regarding McGillis movement however provides the perfect information for the rival Teiwaz faction to give to Rustal Elion. Knowing they oppose McGillis and by extension Tekkadan as well. With the information on McGillis the main group of Rustal, Iok, Juliet, and Vidar debate what McGillis is up to. Vidar explaining about the history of Mobile Armors and Iok explains anyone who destroys a Mobile Armor gets an Order of the Seven Star, effectively elevating them to the head of Gjallahorn. Iok buying this hook line and sinker takes Mobile Suits and moves against McGillis. However I’m not convinced as other then Iok who is clearly ignorant of most things nobody really seemed to care about the Order. Instead they were more concerned with McGillis plan regarding the Mobile Armor something that clearly has immense power and is therefore of extreme importance. While this is all taking place a small subplot of personal character development is happening as Mika, Atra, and Hush take a field trip to Kudelia’s office. Where we learn that Kudelia is taking care of many of the main pilots pay from Tekkadan. As the Orphans don’t even get the concept of money. Showing how truly ignorant of the world they are, something not lost on Kudelia. Who understands if not for her to teach them they will know nothing but war. On Mars along with a guard of Tekkadan’s finest pilots they move to check out the Mobile Armor. However they have left their Mobile Suits at the base as McGillis fears - rightly as it will turn out - that Mobile Suits could awaken the Armor. Something that he clearly does not wish to happen. However as they’re inspecting the excavation site Iok and several Mobile Suits arrives. Mika recognizes the suit from a previous battle but is unable to do anything. Iok announces he will take McGillis in for treason due to the Order of the Seven Stars Theory - which to be fair makes no sense especially if the Order is a legal thing in Gjallahorn - however I digress. Iok though makes a potentially fatal mistake as he steps forward the ground starts rumbling. With a screech reminiscent of something out of Evangelion and a huge laser blast (something rather rare in this Gundam as beam technology isn’t much of a thing) rips apart the ground as the Mobile Armor Hashmal awakens. First amazing as McGillis was explaining everything I just started smiling this got really crazy and I want to see where it all leads. Beyond that the more interesting series design decisions are starting to fit into place. As we all know the Gundams are named after demons found in the Pseudomonarchia Daemonum however we never knew why? Well we do now as Gundams were made to slay Mobile Armors it is kind of fitting that Mobile Armors names are named after Angels. Hashmal being found in Hebrew and Christian Angelic compendiums. Interesting this isn’t the first time Gundam named enemies after Angels the Trinity Siblings in Gundam OO piloted the Thrones Gundams named after a high order of angels. Furthermore this revelation also makes some design choices of the Gundam’s make some sense. Why are the Gundam’s primarily melee based in a military system designed around range? Well if the Gundams were designed to fight heavily armed and armored Mobile Armor it makes logical sense they would be equipped with the strength and speed to pierce said armor. Making the Kimaris’ almost jousting knight design make more sense in hindsight. Also since the Seven Stars are all decedents of those who slayed Mobile Armors it explains why each of the seven stars have ancestral Gundams. Furthermore Mika’s almost prescient ability to sense the Mobile Armor is very interesting as well. Perhaps the tight bond between him and the Barbatos through the Alaya-Vijnana System born out of his battle with the Graze-Ein in Edmonton had more effect on him then previously thought. 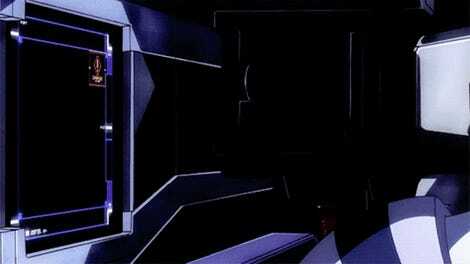 Are we seeing a type of almost Cyber-Newtype in the series? Anyways as always thanks for reading. This was a surprisingly fun write up to do, how about you what is you’re thoughts on the whole thing. Also remember that gigantic crater off Australia’s coast from season one that has not been explained. Well now that we know the Calamity War was a war against gigantic machines... just how big and bad did these things get? As Hashmal for the record is the 6th Order of Angels, there are ten. If they decided to follow ranking conventions we’ve got some seriously big one left to uncover. I’ve never played this game actually however I just love this song. From the Group Back-On which also did the amazing OPing from Gundam Build Fighters they have a connection with the franchise. I was trying to think of a connection to the episode... but I couldn’t. This is here because its a fun song from the Gundam extended universe. Gundam: Iron-Blooded Orphans - A Plan Revealed - Episodes 33 & 34 Blowout!